Most of us have a bookshelf in our homes and my readers know I enjoy reading by all of my book posts. I'm a visual person and really enjoy seeing color. Before I bought my condo I had a interior design blog to keep track of things I like. For instance I love painted walls, I could never live with white walls. My closet is arranged in rainbow order and I don't own any black dresses/shoes/purses/coats because I find it boring. When I first saw a bookshelf organized by color several years ago I thought it looked so fresh. 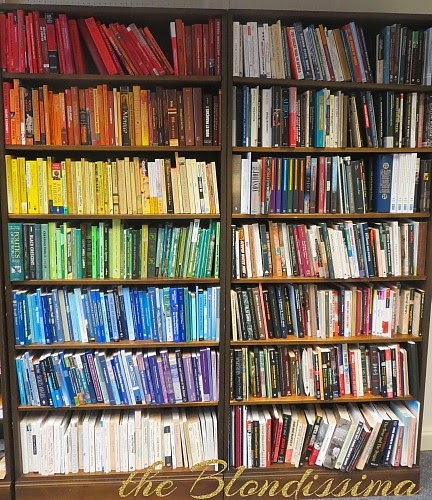 So I recently reorganized the bookshelf in my father's office to try the color method and was very pleased with the result. I think it added a nice splash of color to his office. I'm sure you're wondering and yes I asked my father if his bookshelf was in any particular order (author, subject, title) since he said no I knew that arranging it by color wouldn't make books harder to find. I'm sure he found it to be frivolous and just entertained me, but I smiled at my masterpiece when it was done. I truly think his bookshelf is undeniably beautiful and that by color-coding his shelves I breathed new life into an old space! I think organizing your books by color is the kind of harmless DIY decorating experiment you should try! 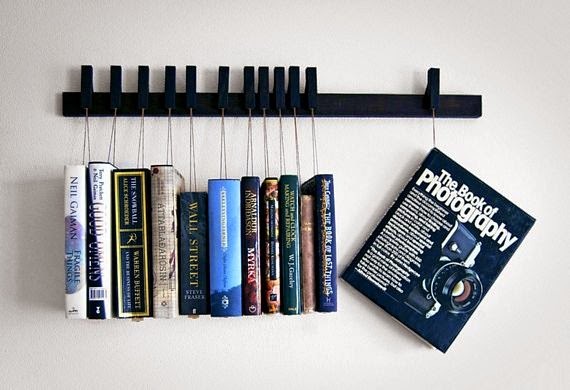 It makes a visual impact with your books by making them look more vibrant. Check out my Winter Reading List here.